Is it former MVP George Bell? Or maybe Cy Young winner Roy Halladay? Even Roger Clemens? None of the above, says the Star. 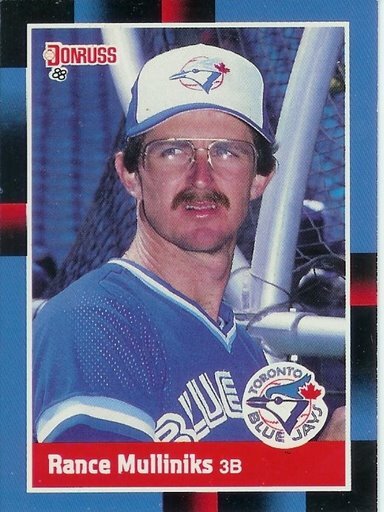 Dave Perkins argues for Dave Stieb, the crotch-grabbing ace from the halcyon days of the 1980s. Richard Griffin votes for beloved slugger Carlos Delgado. The paper’s readers spoke, too, giving Halladay a decisive minority with 27 per cent of the vote (though Rance Mulliniks gets points for the size of his Adam’s apple). Perkins opts for Stieb because he “sure could pitch” and, quite simply, “Stieb was the man.” The often surly right-hander may never have won a Cy Young, but he probably should have taken home at least one, if not two. He also chucked 800 more innings than Halladay, and given Perkins’ proclivity for pitchers, that seems to seal the deal. In 12 combined seasons with the Jays, Delgado hit .282, with 690 extra-base hits, 336 home runs, 1,058 RBIs and a .949 OPS in 1,423 games. Among all-time Jays, the charismatic Puerto Rican leads the franchise in multiple categories. Delgado ranks first in slugging percentage (.556), OPS, plate appearances (6,018), runs scored (889), total bases (2,786), doubles (343), home runs (336), runs batted in, bases on balls (827), extra-base hits, times on base (2,362), hit-by-pitch (122) and intentional walks (128). The only disturbing thing is that he was unable to lead his team to the post-season. For our money, we like the popular choice. Stieb was good, Delgado was better, but, clearly, Halladay is the best. Why? It’s impossible to know! But it sure is fun to pronounce on something so grand, eh, boys?